I just wanted to wish Mark McGwire good luck in his new position as the hitting coach for the St. Louis Cardinals. I have read much praise from the players that he has worked with individually. I think he will do very well in this position and the Cardinals will benefit from what he has to offer. 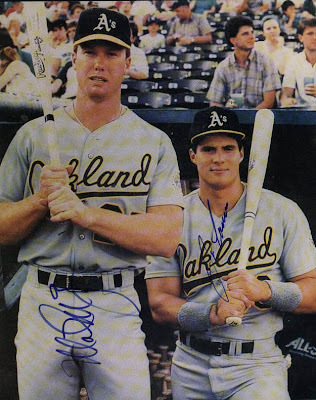 I used to love the A's back in the days of the Bash Brothers, with Ricky Henderson and Dave Stewart. They were incredibly fun to watch play. In those days the A's were one of the best teams in the game and had league-leading payrolls. McGwire was the true star of that bunch, when he was healthy anyway. You should watch the video attached to this article about Tony LaRussa returning to the Cardinals to hear LaRussa discuss McGwire's transformation as a hitter. Below this great photo I discuss the reaction to McGwire's return by the dumber members of the mainstream media and their parroting groupies. ***If people in this country were assigned jobs based on their intelligence and focus on what actually matters most of the Senators speaking out in what I call the Steroid Trials (and their media lackeys) would find themselves working for Burger King. I have read many different articles in the last week or so and hundreds of comments by the readers of those articles that make claims that are just not true or fair. Today I read an article that basically claimed that McGwire was responsible for the suicide of two kids who used steroids. No. No he is not. If a kid is using steroids that responsibility lies with the kid himself, his parents and the people of responsibility around him. I have read the McGwire ruined baseball despite the fact that when he was hitting all those homeruns for the St. Louis Cardinals he was being labeled the savior of baseball. I have read that Mark McGwire now hides from the public scrutiny he deserves because he is so ashamed of his steroid use, and his lies. First, what lies? Can someone please show me when McGwire was proved a liar about anything to do with baseball or him using any form of PED? Second, when has Mark McGwire ever sought out media attention? Remember how when McGwire was hitting all those homeruns and everyone loved him and was anxious to hear his every waking thought, that he avoided the media like the plague. Seems like the kind of guy who avoids public speaking whenever possible. You do not have to like Mark McGwire. I am certain he has habits that may annoy people. Maybe he clips his nails at the kitchen table or he leaves hair on the bar of soap in the shower. But I think it is wrong to punish the man over something that probably had little impact (if any at all, if he even did anything wrong which is not so certain as it is usually made out to be) on his career as a whole and most certainly did not hurt anybody or cause anybody to hurt themselves.